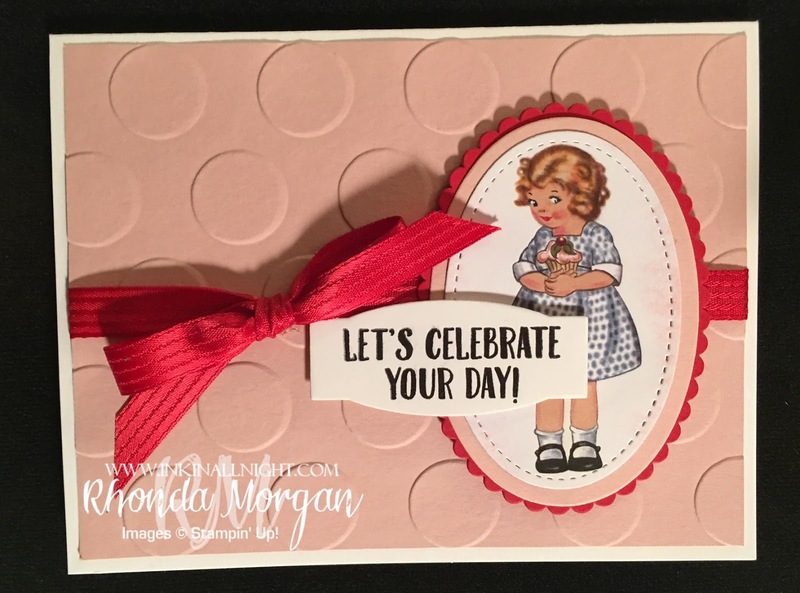 Thanks for stopping back by today as I share another one of my projects featuring the Birthday Memories Suite of products. Now look how totally adorable she is when you see her from the front! She reminds me of the Campbell soup little girl or something equally as cute! She isn't scary at all! I used the Large Polka Dot (retiring, get it now!) TIEF, along with some Real Red 3/8" Stitched Satin Ribbon (retiring, love the way this ribbon ties) and the same Layering Oval framelits and Stitched Shaped framelits. The little girl was die cut out of the DSP patterned paper. The greeting was stamped with Archival Basic Black ink and cut out with the Project Life Cards & Labels framelits (also retiring- another must have!). So there ya go, you've seen her from the front and the back, featuring similar products but completely different looks! Come back tomorrow to see another project to complete my trio for this part of the stamp set and dsp.